android-gradle is a gradle plugin officially maintained by Google Tools developer team and is the official build tool since the announcement in May 16, 2013 at the Google I/O. Learn the basic by reading Configure your build with Gradle. In theory you can install gradle directly, build the configuration files and directory structure by yourself. In practice no-one does that. A gradle project is usually divided in sub-project or modules each containing a dedicated build script. The colon : is used somewhat as a folder delimiter. To use the plugin it has to be applied at the top of the build.gradle file of each module (app in the example). 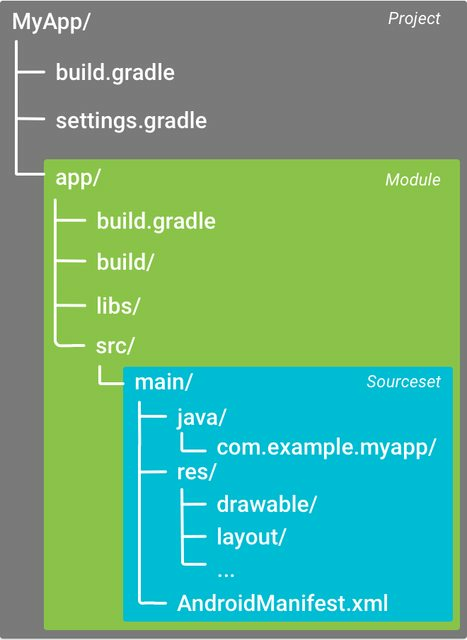 // default build types are "debug" and "release"
Configure your build with Gradle teach you more advanced Android Gradle Plugin settings and options and go deeper in the meaning of this setting. The defaultConfig is called like that because it can be overridden with Product Flavors. The buildTypes tag allow you to setup how to build your app enabling optimization (like proguard), you can learn more reading Build Types. It can also be used to setup signing of your app. You should also learn more on how to Declare Dependencies. As you see the dependencies tag is outside the android one: this means it's not defined by the Android plugin but it's standard gradle. Android Studio will also, by default, install a gradle wrapper. This is a tool you can execute directly from the command line and it will download a local specific version of gradle the first time you execute it. As described in the remarks section the Android build system uses the Android Plugin for Gradle to support building Android applications with Gradle. You can specify the Android Plugin for Gradle version in the top-level build.gradle file. The plugin version applies to all modules built in that Android Studio project. As described in the remarks section you can specify the Gradle version used by each project editing the Gradle distribution reference in the gradle/wrapper/gradle-wrapper.properties file. Check Remarks section for more informations.